The Binary system works in essentially the same way, with the only difference being that it only has two digits. these are visually expressed by the digits 0 and 1, and every number expressed in the binary system is the combination of 0 and 1. The Binary system is essential in modern electronic technology, because any electronic circuit can have only two possible states, on or off. Here in computer language 0 is for on and 1 is for off. This is true of computers too. So, all the information in a computer is stored and transmitted as sequence of binary Digits i.e 0 and 1. Computers can't understand our language and can only understand only its language. A computer's language is made up of a combination of 0s and 1s only as it can only understand these two digit's. As computer can understand only 0s and 1s, so a special coding technique had to be formed so that the numbers, letters and other characters could be converted into a computer understandable format. This coded from of number, letters, words etc is called "The Binary Number Concept". In the binary number system of representation, the base is 2 and only numerals 0 and 1 are required to represent a number. The numerals 0 and 1 have the same meaning as in the decimal system, but a different interpretation is placed on the position occupied by a digit. In the binary system the individual digit represent the coefficients of Powers of 2 rather than 10 as in the decimal system. For example, the decimal number 19 is written in the binary representations as 10011. 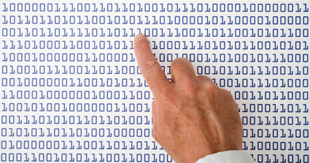 Binary digit is often referred to by the common abbreviations as bit. Thus, a bit in computer terminology means either a 0 or 1.